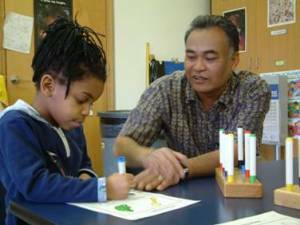 What Does a Developmental Specialist Do? Future educators with a desire to gain the knowledge and skill to work in early childhood and elementary education are likely to consider what a development specialist does when considering possible career paths to pursue. A position as a development specialist requires the ability to perform a number of tasks and the expertise to support children in developing the skills needed to be successful in learning environments. Child development specialists will need to have a foundation in working with children, assessing individual needs, creating plans for therapy and academic support, and working with families and other educators in support and supervisory roles. To perform each of these functions, development specialists will most often be required to hold a minimum of a bachelor’s degree in a field such as early childhood education. In addition to the undergraduate education, most schools will desire for candidates to have experience in classroom settings, demonstrated ability to collaborate with parents, and possibly state licensing or professional certifications. Largely, requirements for beginning a career in child development are dependent on not only individual school districts or agencies but also state stipulations. Additional information on preparing to become a developmental specialist can be found at the National Association for Child Development website. A developmental specialist can work with children at many ages, but the most common age group is likely to be at the early childhood level, between the ages of birth through five. Much of a specialists job in this area of education is to help promote the acquiring of skills necessary for children to be successful in preparing for school. First, a developmental specialist will identify if a child has developmental delays that require additional support. These delays could be related to fine motor skills, literacy acquisition, problem solving, and high risk factors such as premature birth, multiple births, and learning disabilities. After identifying and meeting with children initially, developmental specialists develop plans for helping to encourage and support children in overcoming delays and possible barriers to learning. Finally, specialists must continually assess progress and consider alternative plans for improvement. To work with children at the early childhood level, much of the observation and one-on-one assessment takes place in the home environment. An essential component of the support of children with developmental delays is to also work closely with parents, teachers, paraprofessionals, and other concerned parties in order to help illustrate how to continue to promote growth. Development specialists also often rely on parents to identify areas that need attention. Development specialists might work for a number of different types of organizations. School districts with early childhood education classrooms often hire developmental specialists, and child care centers are also likely to staff professionals in this area. In addition, universities, government agencies, and community resource organizations hire development specialists to work with children, schools, and other related professionals to support learning for all children. From assessment to creating plans for skill development in children from ages birth through elementary school, a development specialist is an integral part of the education system. When considering what a development specialist does, the position is designed to give every child an opportunity to learn and grow.